I haven't done Beauty Tool Tuesday in quite a few weeks so I'm glad to be back with a beauty tool that I've been in love with recently. I really needed a new hair dryer as I've had my old one for quite a while which would spark and made a noise that scared me half to death. Therefore it was an eye-opening to go from a dying hair dryer to a new hair dryer that creates enough air that it could double as a wind machine. 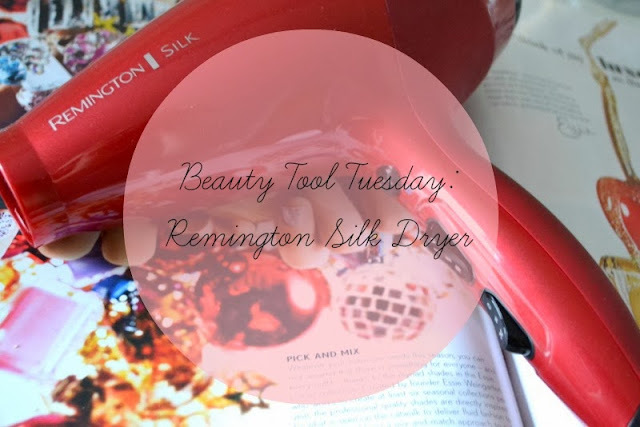 I was slightly dubious that by using a different, more advanced hair dryer I could really change the quality and look of my hair but I have been proven wrong by the Remington Silk Dryer. It drys my hair so quickly and it also has a Turbo boost function that increases the airflow by 10%. There are three speeds - the hot, warm and cool and also a cool burst button that lets out nice cold air which I love to use as I always tend to get really hot and flustered when blow drying my hair. This is the heaviest dryer I've ever used which I view as quite a good thing. To me, this means that it's sturdy, durable and well-made meaning that it will work well for a few years. However, some people may prefer a slightly lighter weight as it can strain your arm slightly if you're using it for a long while. Thankfully I have medium/short hair so as it doesn't take me a long time to blow dry my hair this issue doesn't really bother me. The hairdryer is made with silk ceramic coating and an ion generator which according to Remington 'ensures a silky-smooth salon style every time'. I've been watching quite a few 'How to professionally blow dry your hair at home' videos at the moment and the combination of the new tricks I've learnt and this amazing hair dryer I am able to create salon results at home. If you're looking for a new hairdryer I would definitely recommend this one, it makes all the hair dryers I've used in the past look rubbish. It would also make a great gift! This hairdryer sounds fab! Mine just blew up on me about three days ago (so scary!) so I'm definitely on the lookout for a new one! Love the colour of this too :) great review! This sounds fab! I've been thinking about upgrading my dryer for a little while, I shall keep this one in mind!